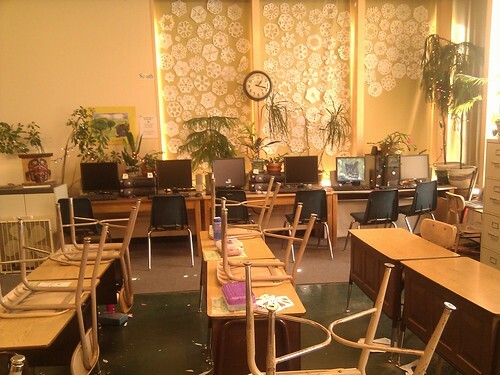 This is the home of the blogs for the third graders in Room 12 for the 2006-07 school year. I'm the teacher in Room 12, and my articles appear in the middle of this page, where you are reading now. Student blogs are listed on the right side, and the most recent student articles (approved by me) appear on the left. Much more to come! - Mr. A. 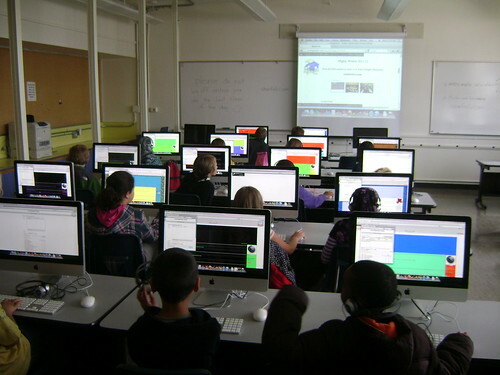 This blog is the new home of roomtwelve.com - for the third graders in my class. If you are looking for the blogs from my wonderful class from last year, they are all still there - look over to the left under "Related links", and click on the link to 2005-06. For this school year, roomtwelve.com will lead you to this blog. I'm very much looking forward to an exciting year! School starts on Wednesday, September 6th. - Mr. A. The students in Room 12 have done a super job writing their "About Me" pieces! We were in the middle of working on a short personal narrative when we had a very scary event happen close to our school - and Room 12 students have been writing about it. Ms. Barb Bailey, our wonderful music teacher, was injured in a car accident just a block and a half from our school. A couple of Room 12 students live close enough to have had seen the aftermath of the accident. It was a bad one. But the good news is that Ms. Bailey is OK! She has a broken bone in her arm and many bumps and bruises. We were all so very worried about her. 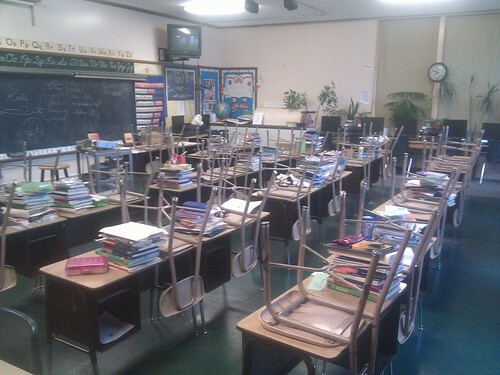 As you can see from the blog entries on 10/5, the students in our class really miss her! Get well soon, Ms. Bailey! - Mr. A. Open House - a podcast! On October 12 we had our annual Open House. There was a room packed full of excited room 12 families that gathered to look around, visit with each other, and listen to what I had to say. It has become a bit of a tradition, my giving a little "talk" for the families. 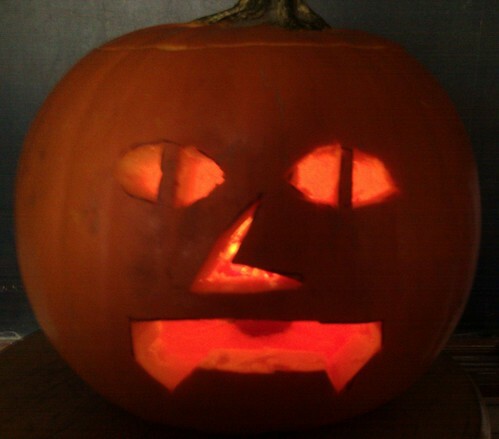 It is the day before Halloween! The writers at roomtwelve.com have been busy working on scary stories. They might be true, they might be total fantasy, they might even be silly. 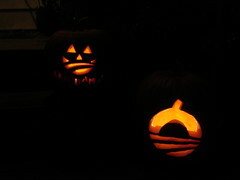 Check out the entries from 10/30 and 10/31 on the left. Parent conferences are happening this week at our school. One of the things we teachers talk about with our parents - is the report card! So naturally, students' minds are on those report cards. Look for writing about report cards from the Mighty Writers of roomtwelve.com this week. - Mr. A. Students in room 12 have been using their imaginations and their writing skills to serve up a little Thanksgiving fun here. Their stories are in response to "Pretend you are a turkey. How will you escape being served for Thanksgiving dinner?" Have a safe and happy Thanksgiving, everyone! - Mr. A. A few students from Room 12 posted articles today, Dec. 12th, writing about gifts. It is the time of the year when many are thinking about getting. I think these students did an excellent job of writing about the other side of gifts - the giving part. In the next couple of days, watch this space for many holiday stories. 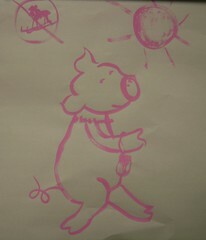 The kids are hard at work telling of holidays they remember - or can imagine. - Mr. A. In Seattle the power was out for hundreds of thousands of people for several days. School was cancelled last Friday, December 15th. That was supposed to be our last day before Winter Vacation, so there were many activities planned that day which obviously never happened. Power is now restored to most people, hopefully! I hope the kids and their families in Room 12 managed to stay warm. It was tough, I know. I was without power for nearly three days. Perhaps some of the students from roomtwelve.com will be sharing their stories from the power outage on their blogs. I will be at the ocean until December 22, so any students writing articles before then will have to wait until I get home to approve them, as there is no phone and no Internet where I am going (imagine that!). Hi students from roomtwelve.com (and anybody else). It's Christmas Day, and as a greeting, I send a little riddle along for you. 1) This change started during the power outage. 2) Watch the video by clicking on the "Podcast" link below. Any students in Room 12 who are successful in blogging or commenting to solve this little riddle earn extra credit in writing! Happy New Year! - Mr. A. 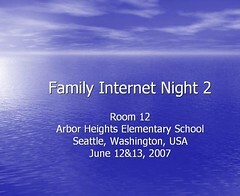 On December 5, 2006, I hosted a Family Internet Night in Room 12 at Arbor Heights Elementary in Seattle. Families were encouraged to come and learn about the classroom blog at roomtwelve.com – and to talk about online safety for the kids. Turnout was great, I thought. Eight families came, a total of 25-30 people filled the room. 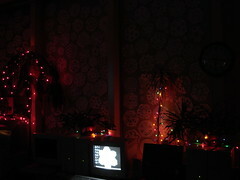 We turned out the classroom lights, turned on the holiday lights that encircle the room, fired up the laptop and projector on the PowerPoint presentation, and we were off, for about an hour. The podcast (4.8 MB) runs 41 minutes. The PowerPoint presentation (1.5 MB) guided the conversation. Listening suggestion: Follow along with the PowerPoint presentation while listening to the audio. On the other hand, the audio stands on its own pretty well, I think. - We are finally back in school full time again! During the past week, we had two snow days and two late starts! Our writing has been a little sketchy lately, but now we’ll be able to spend a little more time on it at school. 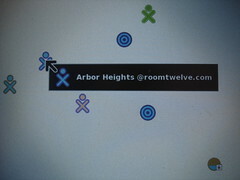 - We have welcomed back some of the third graders from last year to roomtwelve.com! You will find their names and blogs on the right side of this page under “Room Twelve Alumni" (scroll down). Their newly posted articles will appear on the left side of this page, along with articles posted by this year’s class. I want to send a special congratulations to all the writers from roomtwelve.com - especially for the writing you have done on 1/18 and 1/19 - great stuff!! All the articles you sent in on those days are either published - or have comments waiting for you from me about what needs to be fixed before they can be published. I send apologies, because you are all used to having your articles appear almost immediately on your blog after you "request publishing", especially if I have worked with you in the classroom on perfecting your writing. My school email account, the one that notifies me about your blog articles sent in, has been slow lately. I will ask about speeding it up! Have a great weekend! - Mr. A. Readers here may notice a different look on some student blogs - namely, colorful changes. The kids in room twelve (led by Riley1 and Logan) have figured out how to change the background colors and text colors on different parts of their blogs. Very cool! While we are experimenting with the look of our writing, please feel free to leave comments for the writers here on what you think (good or bad) about how we look.... and of course on what we have to say! - Mr. A. The third grade scholars at roomtwelve.com have been writing a little this past week about people they admire. They’ve also been thinking a bit about what they’d like to be when they grow up. Some of their writings are about both. Visitors are invited to check in on their thoughts, leave comments, and let us know who your heroes are – and what your hopes for the future are... Mr. A. Some students from roomtwelve.com showed up with their families for Readers' Night Out at Tully's (a regional coffehouse chain, similar to Starbucks). Kids shared their latest writings with the public, and a couple from our class read articles right from their blogs (on Mr. A's laptop). What a fantastic evening! They have also been READING a lot of other student (and a few grownup) blogs. Later this week they will begin posting articles here about some of their favorite bloggers. Stay tuned! - Mr. A. The writers at roomtwelve.com have been busily putting their thoughts on their blogs about plans for Spring Break (April 9-13). If it seems their writing is especially descriptive these days, we have been making a conscious effort to use adjectives! Happy Spring! - Mr. A.
ps - is your school doing The Earth Day Groceries Project? Earthday, now on to the WASL! This week (4/23-27) they are taking the WASL, the Washington Assessment of Student Learning. They have been getting down their thoughts about the test every day after the testing session, and they will be posting their week-long reflections here on 4/26. 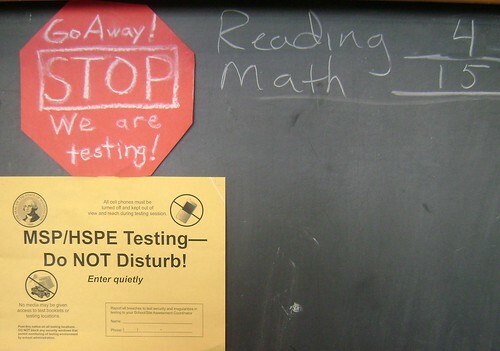 The WASL is Washington State's high stakes test, tied to grade advancement and ultimately high school graduation - so there is a good deal of "buzz" about it around here. I encourage visitors to take a look at what they have to say - and share their own experiences with similar tests in their schools. Thanks - Mr. A. This is just a note to let the readers of roomtwelve.com know that some of the third graders here are publishing drafts of their writing - that is, unfinished work, writing that may contain mistakes. Right now everybody is working on a book for our annual Young Author's Conference. A few brave writers in room twelve are posting their works in progress - for you to take a look at - and even offer feedback on! So if you see an article with the word "Draft" in the title, keep this in mind - and please feel free to leave a comment for the authors. They will certainly appreciate it. Thanks! - Mr. A. Well, school is actually almost out. Today is the last day of school. Almost all of the students in Room 12 have said they want to continue blogging here over the summer, so check back to see what's going on in their worlds. Comments will stay open as well. The bloggers at roomtwelve.com have done a fantastic job of writing this year!! They have all grown as writers, and have learned so many other things along the way. Look for pictures (and a movie) here in the next couple of days. - Mr. A. Our wonderful secretary, Mrs. Marilyn Freeman, is retiring at the end of this school year. She will be REALLY missed by all of the Arbor Heights School community! On June 22nd, the last day of school, we had an awards assembly, where many kids and staff members were honored. Mrs. Freeman got a standing ovation! After the assembly, the Arbor Heights Choir (over half of them from Room Twelve), quickly gathered, planned, and surprised Mrs. Freeman at her desk in the office with a parting song. The short 30 second podcast below is a recording of that moment. More later - Mr. A.
Update: Room 12 kids from 2006-07, you can still write articles, as "Room Twelve Alumni", but you need to check with your parents first (Mr. A sent them an email Aug. 31). 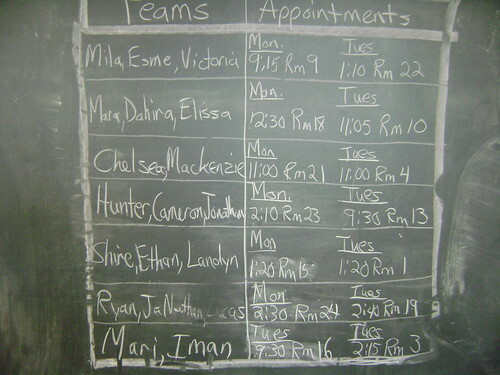 Here's the list of wonderful bloggers in Room Twelve from the 2006-07 school year. They are now Room 12 Alumni! Congratualtions on all your hard work, and smooth sailing! - Mr. A. Welcome to the class of 2007-08! The new bloggers at roomtwelve.com are just starting out, naming their blogs, selecting backgrounds, and (by Oct. 5 at the latest) posting short "About Me" pieces, to introduce themselves. Comments are indeed welcome! This past week (Oct. 15-19), the students in room 12 wrote about something that happens in our class every.... wait, I'd like you to hear it from them. Check out their articles from 10/18 and 10/19. 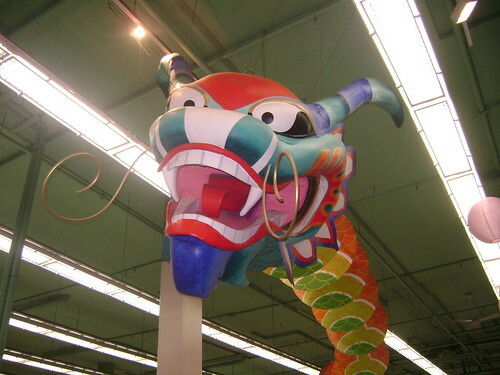 On Oct. 11, we had our annual Open House. Tons of parents and kids from Room Twelve came and got the grand tour. What everybody got as well was a little talk from me about what our classroom is like and a little about what we will be doing this year. Click on the podcat icon below if you'd like to listen to the short talk (about 16 minutes). - Mr. A.
Thanksgiving is two days away, and the students at roomtwelve.com are hard at work writing. Last week everybody published a short article on things they are thankful for. It's amazing when you stop and think of all that we have! Pretend you are a turkey. 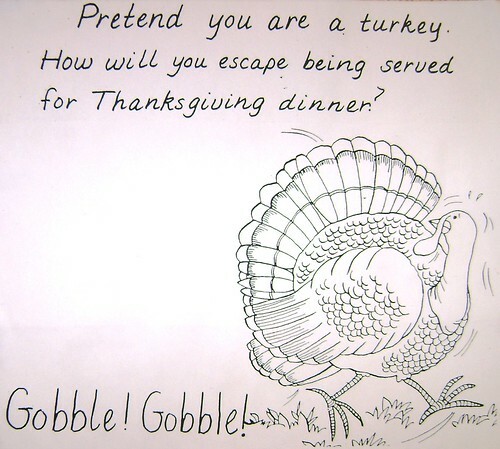 How will you escape being served for Thanksgiving dinner? Happy Thanksgiving! - Mr. A. To all past bloggers here at roomtwelve.com - all of your blog articles are back online! For the past few weeks, they have been unavailable, while the servers for classblogmeister were upgraded. So, for those in Room Twelve from 2005-06, your blogs are all intact, right here, where they always have been. There is also a "Related Link" to your blog on the upper left corner of this page. For those in Room Twelve in 2006-07, your articles are now ALL back, under "Room Twelve Alumni", on the right side of this page. Many, many thanks to David Warlick, for giving us Classblogmeister, the wonderful tool that lets us blog here safely! To the readers of this blog, there is a new feature here which you might find interesting: "Teacher Assignments". 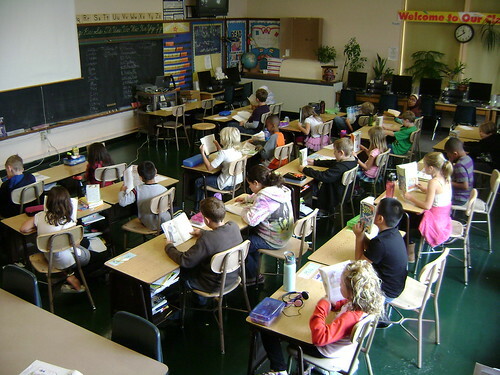 In the left column of this page are assignments given by me (the teacher, Mr. Ahlness) to the third graders at roomtwelve.com. So if you are interested in reading different points of view on and different interpretations of those assignments, please check out this feature by clicking on an assignment. All student writing on that topic will be listed in the center column (where you are reading now), underneath my description and expectations of the writers. Many thanks to David Warlick for adding this to our blog. Happy Holidays! - Mr. A. It's New Year's Day, and many people are busy making New Year's Resolutions: like watching less TV, losing weight, learning something new, and so on. They are usually about making yourself better in some way. I have a couple of resolutions. In 2008 I'm going to spend more time writing on my blog (this one, too), and I'm going to spend more time outside every day - rain or shine. I'm not going to say exactly how many articles I'm going to write, or how many minutes I'll be outside, but I AM going to do more of both. So... do you have a resolution or two for 2008? If you do, and would like to share, please send in an article from home before school starts up on January 7th. It will count as EC (extra credit)! You'll see a "Teacher Assignment" for it over on the left side of this blog. 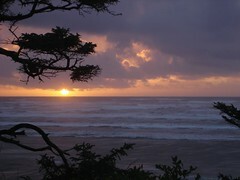 So, to get started on the outside thing, I'm headed off to the Washington Coast for a few days with my wife. There's no phone or Internet, so I'll be checking your articles on Sat. or Sun. Happy New Year! - Mr. A. The kids at Arbor Heights had a special guest visit the school today, author Laura Kvasnosky, author of the Zelda and Ivy books - and many more. We just added one more computer to our classroom. Now, we have lots of fast computers - 12 desktops and 5 laptops. So you might think the newest addition would be REALLY fast. It's not. It's the slowest one, and the smallest. 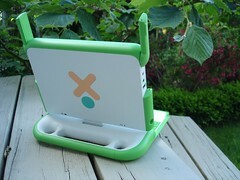 It is the XO Laptop, from OLPC (One Laptop Per Child). What it lacks in speed and size, it make up for in its very cool design and its ability to do many things. ps - to the kids in Room Twelve.... word has it that we will probably be getting another one! No, it's not hugs and kisses, even though it is Valentine's Day. 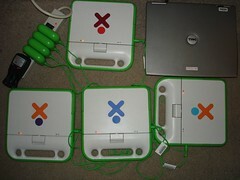 As if the day were not exciting enough, we also got to try out all THREE of our XO laptops today! Hi Room Twelve, this is Mr. Ahlness. I talked with Mrs. Luke last night, and she said things went really well in class on Thursday, and that many of you were very helpful to her and each other. Wow! That sure made me feel good - nice job. And your writing - oh my goodness! I checked my email at 1:30 in the middle of my presentation (to about 50 teachers), and there were 28 messages!! I approved a couple, some we looked at quickly and decided to wait on, but most we did not even get to - sorry! You wrote so much!! You should be proud of yourselves. I'm about to hop on the bus to go back downtown, but I thought I'd leave a little picture for you. You won't be able to see it at school on Friday, but maybe you can check from home over the weekend. See you Monday! - Mr. A. Well, a couple of things have happened that are pretty cool - and summer is just getting started. First, roomtwelve.com students are still writing here: Emily and Bryce have both added articles - way to go, and keep it up! 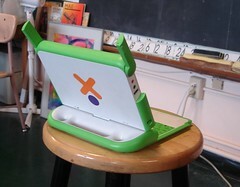 And our classroom has just received another XO laptop donation! So next fall the third graders in Room Twelve will start the school year with 4 XO laptops: Lincoln, Mark Ahlness, Earthday, and our newest - Jude, pictured here. 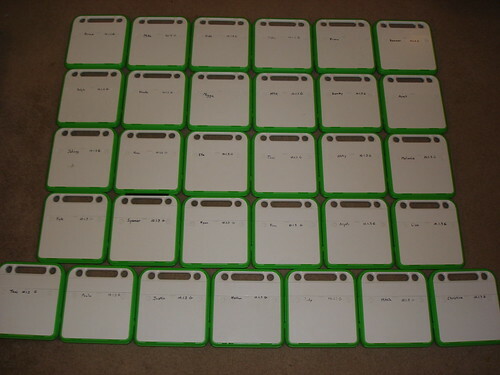 I am amazed and thankful for the generosity of the individuals who wanted their XO's to be in our classroom. Thanks again! - Mr. A. Welcome to the class of 2008-09! 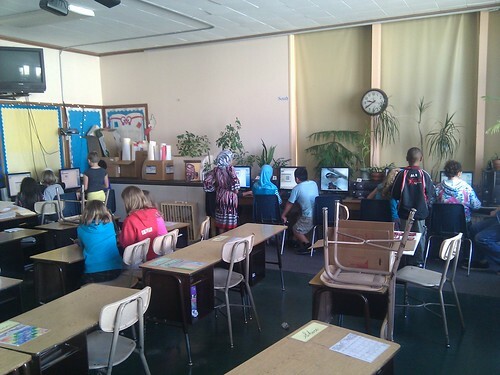 The third graders at roomtwelve.com are now blogging here, less than a month into the school year. Their first articles are short reflections on their experiences "so far" in third grade. Please take a look at some of the newest posts, on the bottom left side of this page. You can also browse through individual student blogs on the right. Under "Room Twelve Alumni" you will see third graders in room 12 for the past two years - and on the top left of the page is a link to 2005-06 class - three years go! If you'd like to leave a comment for this year's class ("Room Twelve"), they would love to hear from you - and we will do our best to get back to your blog - if you leave your blog address in the URL field for the comment. 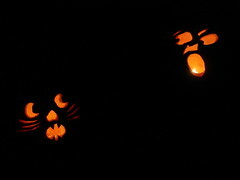 The students at roomtwelve.com have been busy writing creepy Halloween stories this week! Look down of the left side of this page under Student Entries - for Oct. 29-31. Here's a picture from my front porch on Halloween. Here are more. I figured it would be OK to post this here, since our class voted 20 to 1 for Obama when we participated in the national Weekly Reader Election poll. Greetings and Happy Thanksgiving wishes to all readers of this blog. There is some wonderful writing here, done by the third graders in Room 12 at Arbor Heights Elementary School in Seattle. Check out their latest "Turkey Escape" stories! To the students of Room 12, the picture here will give you a hint of something to be thankful for when you come back to school after Thanksgiving (yes there are 5 now!). Finally, anyone interested in the effort to save our school from a recommended closure, please visit savearborheights.com. The third graders in Room Twelve at Arbor Heights have been writing about the proposed closure of our school. Their articles are grouped together for easy reading, at "Save Arbor Heights". The list of posts is sure to grow, so please bookmark the site and check back later. These young writers would welcome comments from one and all, so feel free to respond to them individually (the blog is totally moderated). 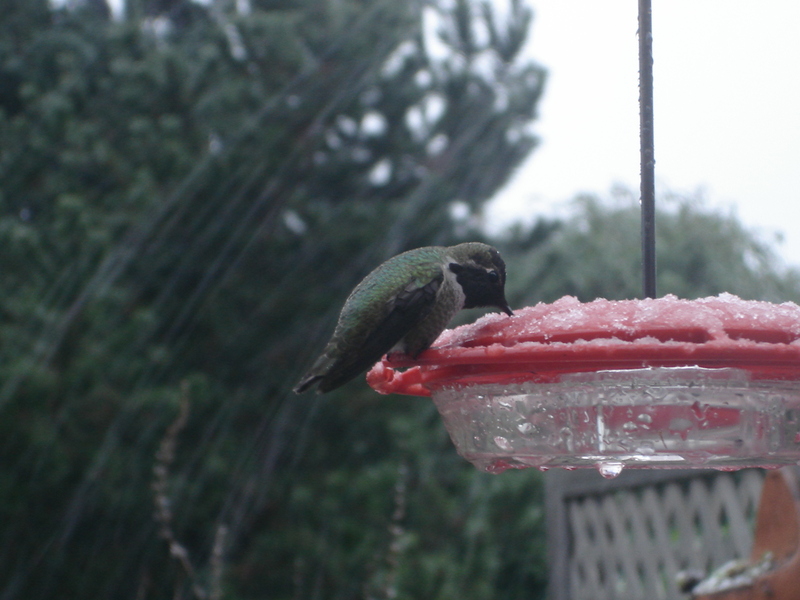 While staying out here in Ithaca, NY for a few days, I took this picture of a cute little bird at a feeder. Can anybody guess what kind of a bird it is? 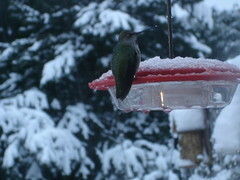 We do not see these birds in Washington State, or the western US. If you have a guess, leave a comment here. Thanks! Keep up the blogging, Room Twelve! - Mr. A. It doesn't snow all that often in Seattle, so when it does snow, it's usually a pretty big deal. To read some of the thoughts roomtwelve.com students had about the recent snowfall, or just about snow in general, click on this link. Be sure to check back, as the list of stories will grow during the week of 12/15 to 12/19. - Mr. A. Students in Room 12, please feel free to add blog articles about what is going on during your vacation. They will all appear on "Vacation Thoughts". I am finally back from the East Coast, and I am really looking forward to getting back to school on January 5th, 2009!- Mr. A. The New Year is a time when people start thinking about what they could do better (like read more), or about things they'd like to do less of (like eat less junk food). So students of roomtwelve.com, do you have any resolutions for 2009? Post an article on your blog for extra credit in writing, and let people know what you will be working on this year. Blog visitors, feel free to leave your resolutions in comments here or to student blogs as they appear here. Other classrooms blogging about their resolutions are here and here. Watch for student stories here about the start of spring! - Mr. A. For the Young Authors' Conference at our school this year, the students of roomtwelve.com wrote a book that was made up of the best articles from their blogs - right here. Here's a picture of all of them. If you click on "The Best of My Blog Book" Assignment, you'll be able to read about their process! - Mr. A. Big things are happening here at roomtwelve.com. First, there is a new group of third grade bloggers (on the right, under Room Twelve) who are just diving right in, setting up their blogs and already posting articles on their blogs. This is certainly a record for a fast start! I look forward to lots of great writing and conversations here during the 09-10 school year. There is also some pretty exciting news for some of the Room Twelve Alumni (on the right, down a bit). Nine students are no longer there - but that's because their blogs have been moved to their current fifth grade teacher, Mr. Gonzalez! Best of luck to those wonderful writers as they continue on with their writing! To visitors: all student blogs can still receive comments. They are, as they always have been, moderated by me. Thanks for stopping by. I hope you find some enjoyable reading. - Mr. A.
Hi students in room 12! About that impossible to solve Spring Break T-puzzle homework. Hopefully, a couple of you (!) have got it figured out by now. If you don't, here's a BIG hint: Think diagonally. Good luck, and see you in class tomorrow - Mr. A. Happy summer! - Mr. A. The third graders at roomtwelve.com have been working very hard to create some spooky stories for Halloween... Click here to read them all. WARNING - some of them are really, really creepy! Pretend you are a turkey. 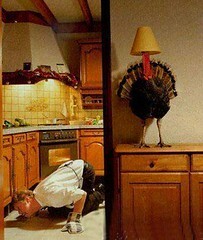 How will you escape being served for Thanksgiving dinner? You can read them all (comments are always welcome) by clicking on Turkey Escape 2010 here - or under Teacher Assignments on the left side of this blog. Happy Thanksgiving! - Mr. A. 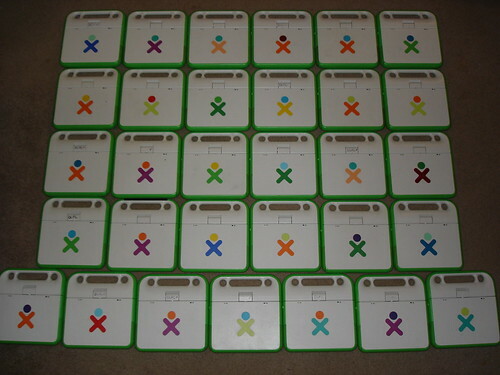 In the past few days, we have become a 1:1 classroom with XO laptops, meaning each student gets to have their own XO! There will be much more to say about this, but for now, here we are (most of us) showing off our XO's. Happy Earth Day! (April 22nd, every year) - Mr. A. Welcome to the class of 2011-12! Today all the third graders at Arbor Heights got a look from the staff at Pacific Northwest Ballet, to see if they might qualify for Dance Chance, a really wonderful opportunity. Our school has partnered with PNB for many years in this exciting program. Four students from our third grade classes were invited. One was from Room Twelve! Open House in Room Twelve! Turkey Escape - and Spinning! Their teacher thinks they're mostly pretty creative solutions - well, sadly, not all have a happy ending... Anyway, you can read all of their stories (and feel free to leave comments) here. And just because, one time every year, we play Spin the Turkey. Total chaos, total fun. With Winter Vacation now upon us, it's time to reflect on events we remember happening at this time of the year. 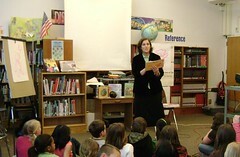 The third graders at roomtwelve.com have been busy working up narratives of memorable events. 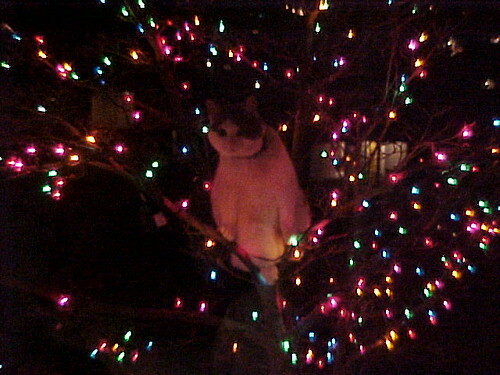 Click here, or just click on the cat in the tree below. As the sun rises on a New Year, the 3rd graders at roomtwelve.com have been thinking about how 2012 can be a better year - for themselves, and for the rest of the world. Their visions range from extremely personal resolutions, to all encompassing wishes for a better world. 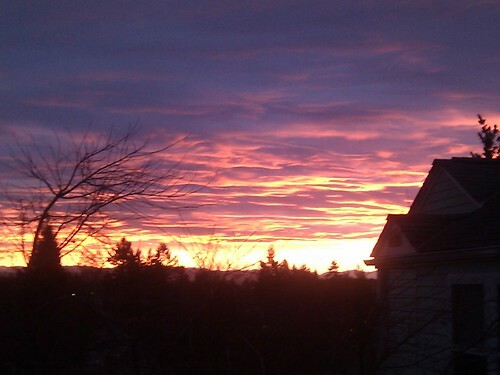 Click on the sunrise below, and enjoy! Most people have taken their holiday lights down by now (January 11). And there are a few who keep them up. We've been talking about it in class this week. We took a few minutes yesterday for the kids to send out their thoughts on their blogs. Click on the picture below to read what they had to say. Then we took a vote on whether or not our classroom holiday lights should stay up or come down. The kids decided they should stay up until the end of January! 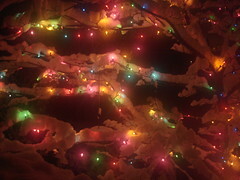 Yay, Season of Lights! - Mr. A.
ps - the picture above is from my back deck. The tree is from our living room, and my wife and I took it down on January 8th, but we couldn't bear to throw it away. 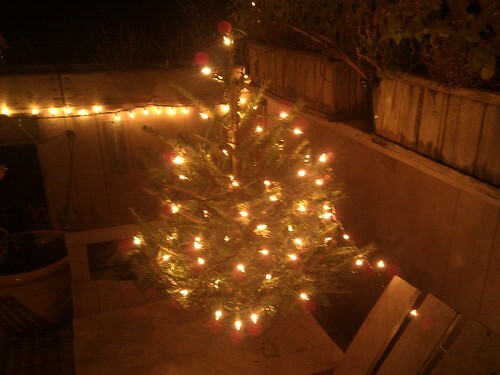 So we put it on our deck, wrapped a string of lights around it, and we get to enjoy it for a while longer! I told the kids at roomtwelve.com that if they were able to make enough six sided snowflakes to cover the 3 window shades in our classroom, we would get a snow day. So several took home snowflake paper when they left early (see the clock) because of a snow warning. At that time there were not enough snowflakes to cover the shades. They must have made a ton when they got home, because we just had 3 snow days, one for each shade, I guess! If you click on the picture below, you can read some of their thoughts on snow, sent in from home, during their unexpected vacation. - Mr. A. The mighty third grade writers at roomtwelve.com have spent the last couple of weeks creating books - yes, ink and paper, hold in your hands, actual books! Those books were their contributions to our school's annual Young Author's Conference. To read what they had to say about that - and to actually read their books - click on the picture of some of them below. They have included links to pdf versions of their books in their writing! 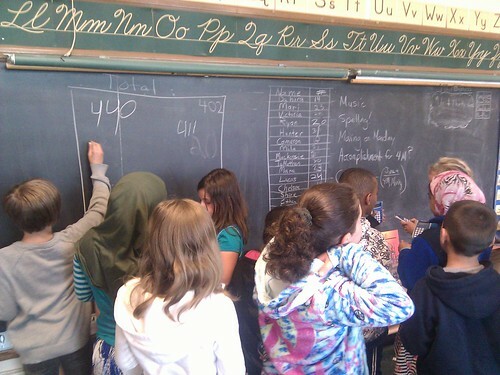 The third graders in roomtwelve.com just finished one of the most difficult tasks they will have to do this year - speak in front of another classroom. 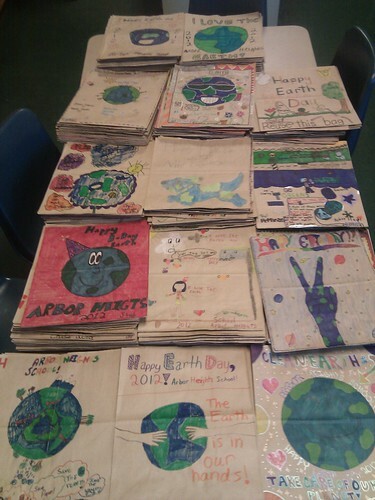 They were distributing paper grocery bags and information to all the classrooms in our school, which is participating in The Earth Day Groceries Project for the 20th year! Click on the image from our chalkboard of the complicated delivery schedule we had for two very intense days, and read what they had to say about the experience. 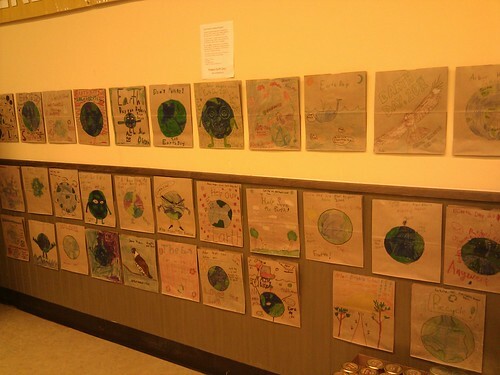 The students at roomtwelve.com have worked very hard coordinating the Earth Day Groceries Project at our school over the last three weeks. We just delivered the school's decorated bags to Safeway. 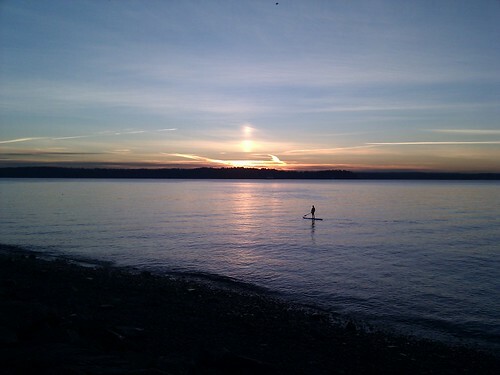 You can read about the story and see a picture of us on the West Seattle Blog here!. I'm very proud of the work my students have posted here this year, and over the past 6 years. They have pushed the envelope, and many have worked on their writing well beyond the school day. A few weeks ago I was invited to go down to a local TV/Radio station complex in Seattle, to help promote a grant opportunity for teachers - and classrooms interested in doing some cutting edge work with technology. So I went. Our school just got a new computer lab, and it's pretty exciting up there. Not only is it all cleaned up with new wiring, but it's full of shiny new iMacs! 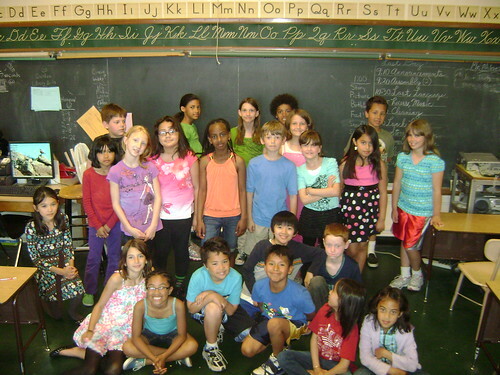 Click on the picture of our class below (during their first visit) to read what they thought about it all. We just finished the MSP, Washington State's "Measurements of Student Progress". There were two tests, reading and math, taken two days apart. The picture below shows the sign we put outside our classroom door - and the results of a vote for the part of the test they liked best. 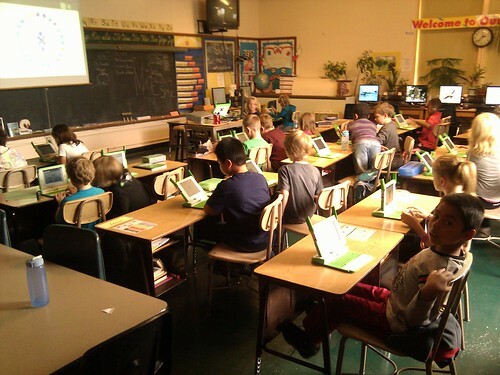 Click on the picture to read what the students at roomtwelve.com thought about their first experience with the test. I had a little fun recently, creating an art project in my backyard out of spiral tiles I had made (and saved over the years) from teaching art. Our classroom made clay tiles with spirals on them, based on "Spiral Jetty", and then we hung them together as a quilt, for the school to enjoy for a while. 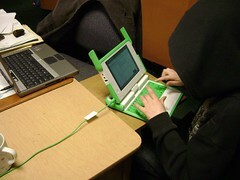 Now that this blog is officially closed for new student writing, I thought it would be good to take a look back at an important part of the last five years in the roomtwelve.com classroom: the XO Laptop. A week ago I sent off the 31 XO Laptops from our classroom Lending Library to the Columbus School for Girls, in Columbus, Ohio. They will be used to help the students there learn about how computers work, specifics on the XO Laptop (like how they run, learning how to take them apart, and so on) - and at the end of the school year, students from the school will take them to St John in the Virgin Islands, where the next chapter of their XO Laptop lives will start. 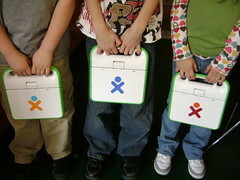 Students have written about them many times as well, the latest in October, 2011, About the XO Laptop. 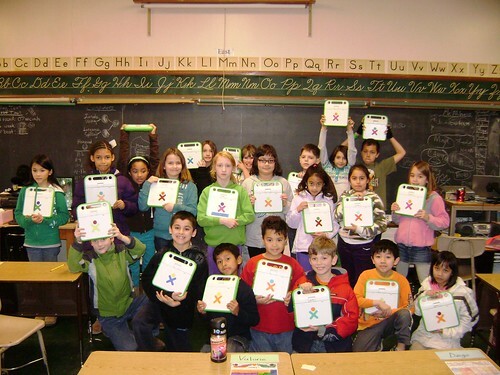 OLPC News just ran the story that I wrote about the long journey of the XOs in room 12, The Story of 31 XOs Sailing from Seattle to Ohio.